Is the dog a purebred Golden Retriever? Is the dog a male or a female? Why would you like to surrender the dog? Does the dog get along well with new people? With other friendly dogs? With cats? Has the dog ever bitten or seriously threatened to bite anyone? Has the dog been in any dog fights? Does the dog let you take food and toys away? Does the dog live inside or outside? Is the dog up to date on shots? Neutered or spayed? On heartworm preventative? On any other medication? Does the dog have any known medical conditions? Does the dog have any bad habits? Can a picture of the dog be emailed or mailed? How long can you keep the dog if we must put the dog on a waiting list? We accept Goldens if we have space and resources available basis regardless of their age or medical condition. We are an all-volunteer group and foster the Goldens in our homes with our own dogs. Once we have room for the dog, we will arrange for a volunteer to come meet the dog, either in your home or at a mutually convenient location, and will make our final intake determination at that time. When your dog is accepted into our program, you will be required to sign a legally binding document which gives sole ownership of the dog to Love A Golden Rescue. Please provide us with copies of any of the dog's veterinary records or other records such as AKC papers, obedience class certificates, etc. Please provide us with any prescription drugs which the dog is currently taking. Your dog will have an easier transition if you send along your dog's food, toys, bedding, crate or other familiar items. 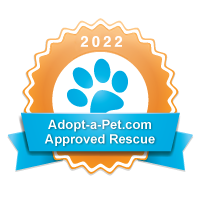 Our goal is to find the best available home for our foster dogs. You can read about our adoption process and about the care we give the foster dogs on the website. Our volunteers do their best for the foster dogs to be happy and healthy and to make the foster dog's transition to a new home as smooth as possible for the foster dog.